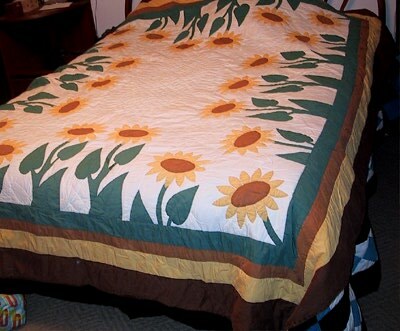 My friend Jean has been bugging me to put pictures of my quilts on my web page. Here you go, Jean. I couldn't find pictures of the ones I gave away, which is too bad. I was able to get mug shots of the ones hanging around the house in their various states of being used to death. My great-grandmother made this one in the 20s or 30s. 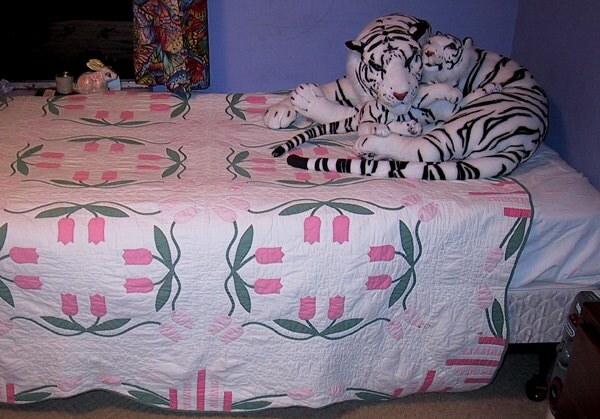 I had it on my bed when I was a little girl. 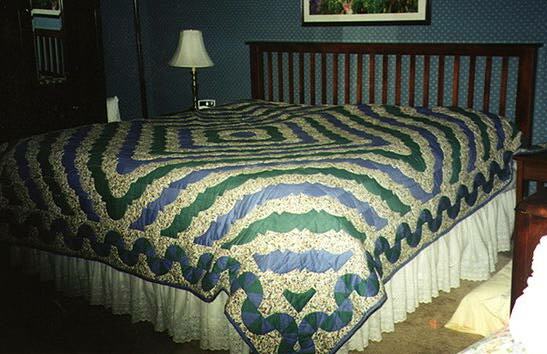 Perhaps this is why I entertain the old-fashioned notion that quilts should be used on beds. My grandmother made this quilt top, and my mom finished it. She added the border to make it bigger and paid "some Mormon lady" $50 to quilt it by hand. 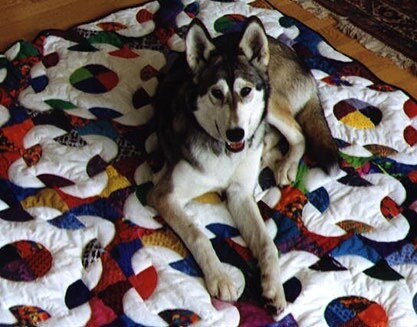 Both of these old quilts were made from Mountain Mist patterns, which are still available here. 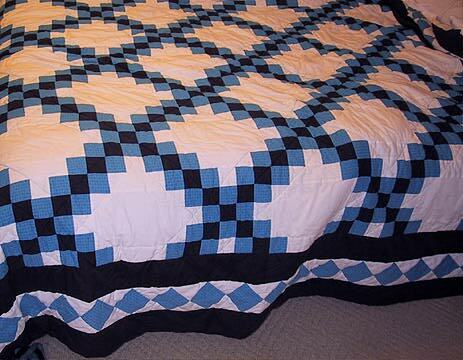 This is the first quilt I ever made using strip piecing. It was the beginning of the end for me. 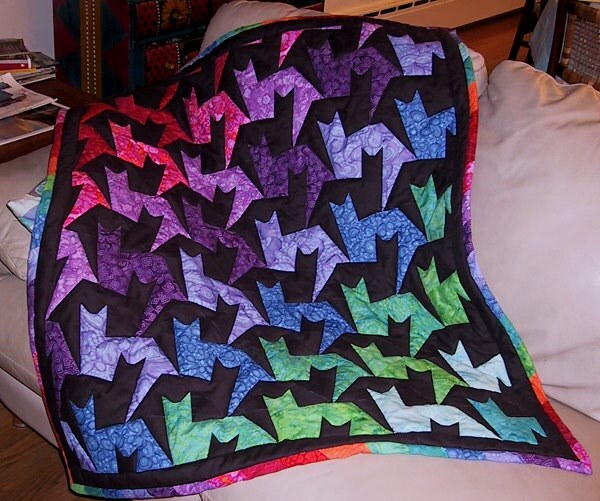 I made two baby quilts like this that were red, black and white and one that was purple and blue. 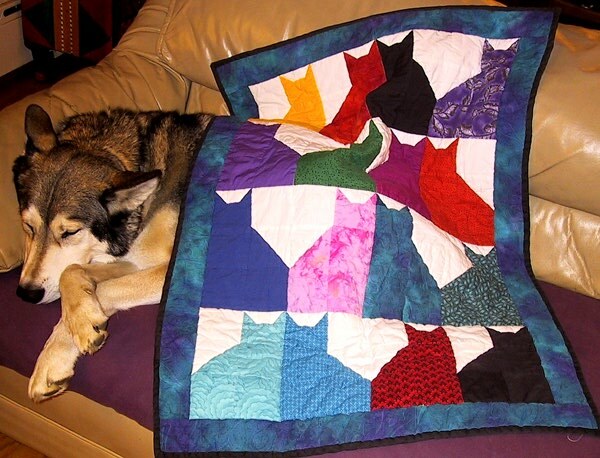 This is a quilt that I made for Aaron when he was about 4. He used to sit on my lap while I sewed. 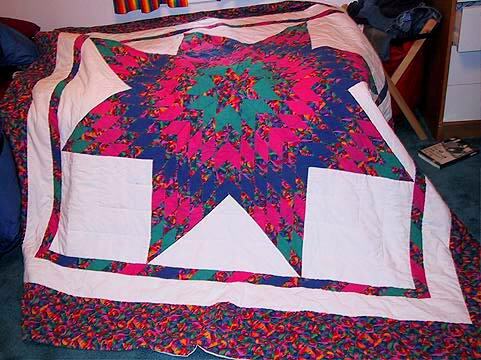 He really wanted a quilt out of that bright print, which was called Pablo's Puzzle. He still uses it, so I guess he chose wisely. This one is a Drunkard's Path variation. I was inspired by the fabric I used for the border. This is another Drunkard's path variation. I call this a scrap quilt, but in reality the "scraps" are mostly fabrics that I bought on impulse. Tundra enjoys modelling it. This is a baby quilt that I made for Natalie. It's hanging on the wall now. This was during the period when the 3D look was appealing to me more and more. 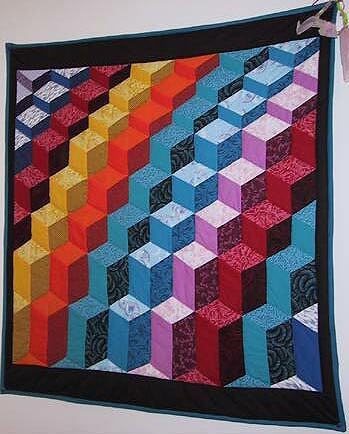 Another 3D-looking quilt. This one is just a throw. The black sets off dog hair nicely. 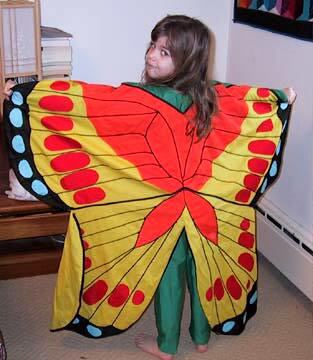 This is a quilt that I made for Natalie when she was a baby. I designed it so that the cats were made up of right triangles. Don't ask me why I felt a need to do this. 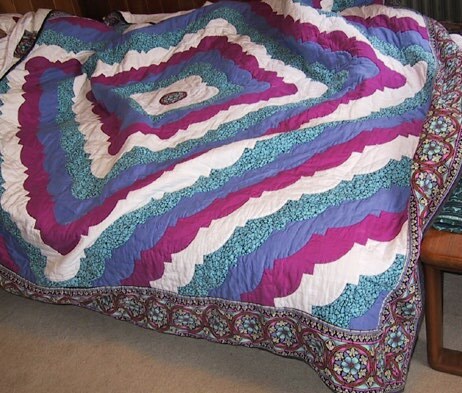 This is the quilt that I made for my sister-in-law, Sara, when she got married. She chose the fabrics. 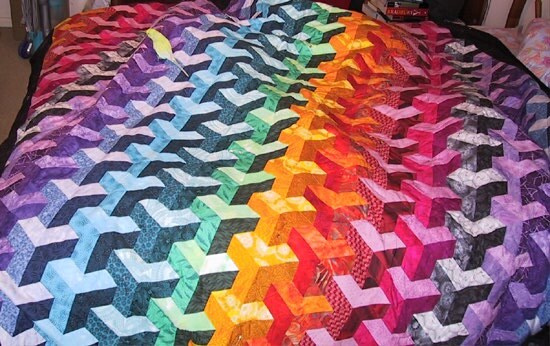 I quilted it by hand, which took me 6 months. I have a bad feeling it doesn't get used, because there's a heap of something to the far right in the photo. I made this one for my sister-in-law, Karen, when she got married. This time, I chose the fabric myself. 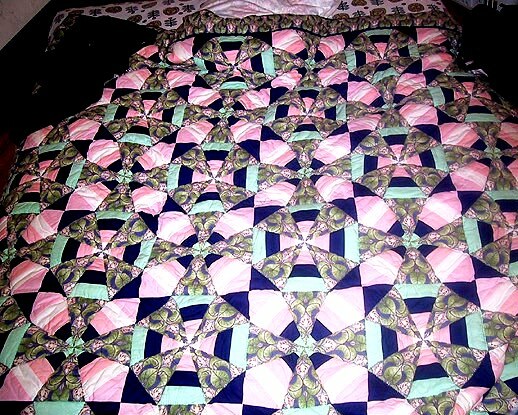 I also hand-quilted this one. This pattern is a real pain in the neck, because there are no shortcuts. I had to cut out all those darn pieces. Baby quilt for the mystery Italian bambino due when my mom and I are there. And that's the end of the tour for now.